The "Comparative hour/divide" timepiece developed and patented by Swiss watchmaker Chanson David is considered as the world’s first mechanical decimal division wrist watch, which displays the time based on both conventional(sexagesimal) and International System of Units (SI) approved decimal measurements. This innovative wrist watch displays time with a comparative and concurrent display on the same dial with two scales of the two types of measuring time. 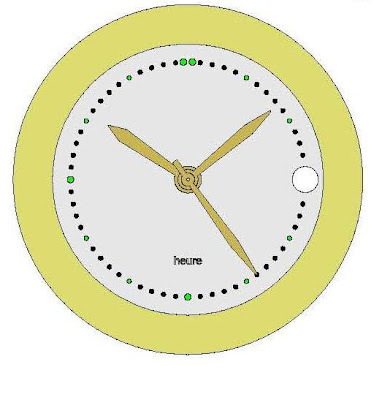 The central part of the dial indicates the time in sexagesimal divisions, i.e. hours, minutes and seconds. The tip of the hour hand extends to indicate a decimal division of time measurement on the external part of the dial in ("divides" and fractions of a "divide"). The proposed decimal division of time obviates the need to convert the sexagesimal units (hours and minutes) into seconds and is in keeping with the SI system. Adopted in 1960, the International System of Units (SI) is designed in a scientific manner. It is based on 7 base units through which all physical sizes can be measured. The metre (length),the kilogram (weight), the second (time), the ampere (the intensity of the electric current), the Kelvin (thermodynamic temperature), the mole (amount of substance), and the candela (luminous intensity) are the 7 base units. The base unit of time is the second.The second is defined as being the duration of 9'192'631'770 periods of the radiation corresponding to the transition between the two hyper-thin layers of the fundamental state of the atom of cesium 133. The relationship between the hour, minute and second is sexagesimal, whereas the SI strives to define units that have a decimal relationship. The division of the average calendar day in 2 x 10 units would be in accordance with the SI. The decimal unit of time would be the "divide" (decimal division). 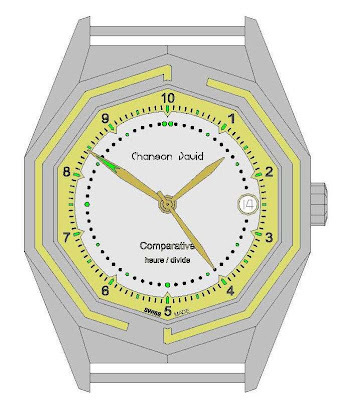 Introduced in 1999, the revolutionary "Comparative hour/divide" wristwatch offers the simultaneous display of the sexagesimal divisions (hour and minute) and the divisions by ten ("divide") on a two scale dial. 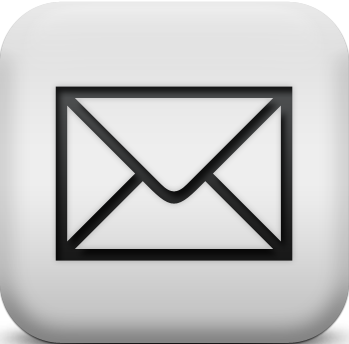 The hour and the minute are units of time from the International System of Units (SI). However, they do not have any consistent relationship, as their relationship is sexagesimal, whereas the SI strives to define units with a decimal relationship. As such, the units of time given in minutes or hours need to be converted. The second is fractioned decimally, whereas the hour and minute are fractioned sexagesimally. The second, current base unit for measuring time, is therefore not compatible with the decimal system. In order to make it consistent, a new unit would have to be created. Mathematical logic and the SI plead in favour of a decimal division for the measurement of time. The division of the duration of the average calendar day (currently 24 hours, or two periods of 12 hours) in 2 x 10 units would comply with the SI. However, the replacement of the sexagesimal division by a decimal division of the measurement of time would require a period of adaptation, from which arises the need to create a comparative and simultaneous display on a two scale dial of the two types of measurement of time. 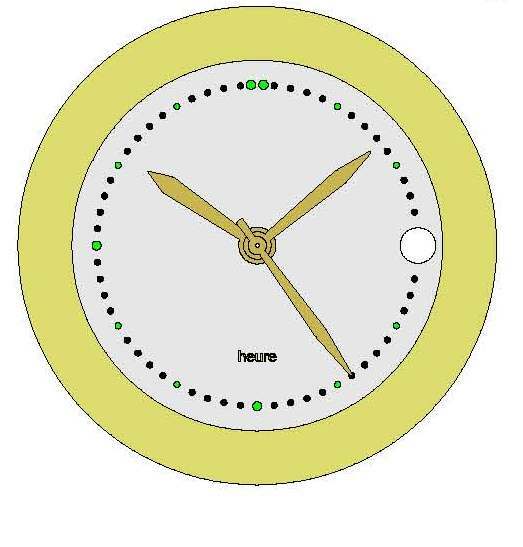 For example, on the dial of the above figure, the position of the hands shows 10 hours, 8 minutes and 24 seconds. On the dial of following figure, the tip of the hour hand shows the correspondence of the decimal unit in terms of the sexagesimal units. 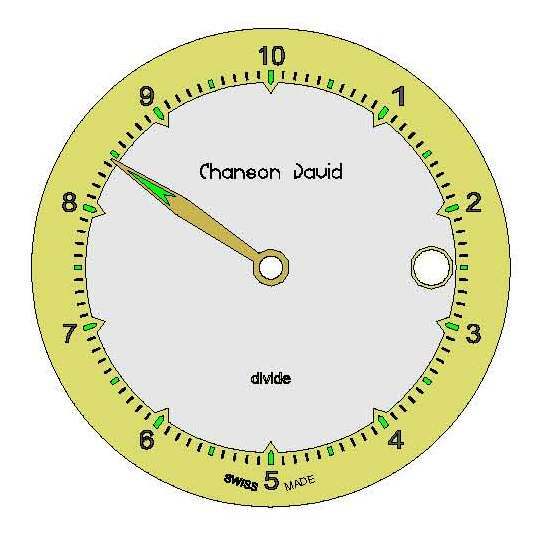 The following figure is a graphical representation of the Comparative Watch "Hour/Divide” by Chanson David that features simultaneous display of the sexagesimal divisions (hour and minute) and the divisions by ten ("divide") on a two scale dial. The "Comparative hour/divide" wristwatch is equipped with a Swiss mechanical movement with a date indication at 3’ clock. 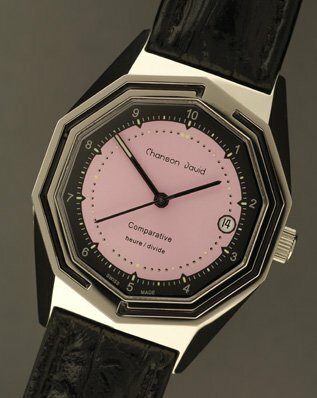 Its decagonal shaped case is made of stainless steel and different dial variations are available. Retail price is approx. 300 Euros. If you are looking for a unique watch, this might just be the one for you!